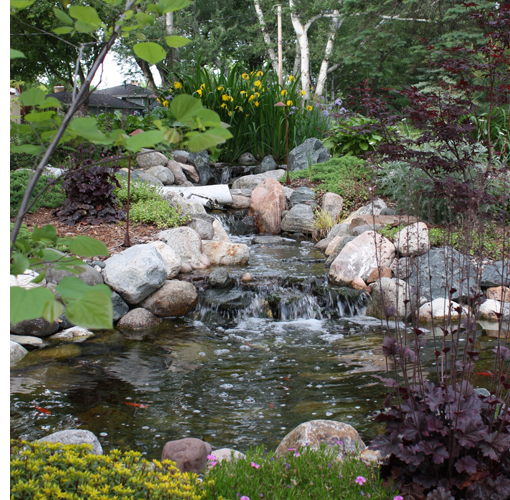 Lifestyle Creations founder, Bill Osmundson, is a Graduate of Iowa State University with a degree in Landscape Architecture. Immediately after his graduation in 1980 his formal education was enhanced by several years of "real life" experience at Blackmore Nursery in Mason City, Iowa where his knowledge of plant materials increased exponentially. Along with this knowledge, Bill's love of water, woodworking and construction, as well as a strong sense of design lead him down the path of starting his own business and becoming a landscape contractor. After 30 years in the industry his love of landscaping continues to show in every project he works on. Lifestyle Creations is dedicated to designing and installing unique landscapes that fit not only the clients needs and desires but also their budgets. Making the client's dream a reality is the goal in every design we create. Whether a water feature, paver patio, deck, gazebo or planting bed, attention to detail and how the client will interact in the space is paramount. The design must fit the client's lifestyle. Our mission is to take your ideas and dreams and make them a reality. We accomplish this by melding these dreams with our product knowledge as well as our design & installation expertise and create your unique landscape. A landscape that will not only fit your lifestyle and budget, but also stand the test of time.